The weather this week had started to improve so I decided to stay local and have another visit to Inspired Angling Fisheries near Yarm. The previous session at this venue threw up some great roach and I wanted to bag some more of these silver beauties and hopefully some of the venues carp too. I arrived at the fishery at 7:30am after cleaning the frost off the car, hoping that a cold overnight snap wouldn't affect the fishing too badly. I was the only angler fishing so I had the choice of pegs, so decided to fish peg 7 which gave me the point of the island and also open water. 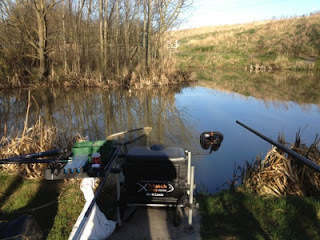 Before I arrived at the venue I decided not to take any rods so it would be a pole only day. The Set-Up 3 pole lines all at 13-14 metres: To the point of the island by the reedsTo the left side of my swim, again to the reedOpen water to the right of the island I had heard that chopped worm was working well so I took some casters, red/white maggots and worms. ﻿﻿﻿﻿A match organised by Neil (ns69) via the Match Fishing Scene website with points counting towards the MFS Champions League at a venue I've been to a few times over the years, Lawn Farm Fisheries near Cambourne in Cambridge. There was a good turn out of 20 anglers and it was great to see some familiar faces as well as meeting some new guys. Today we would be fishing Honeysuckle, the snake lake. The Draw The normal non-orderly queue appeared around Neil and Neilo as they started the draw. I drew out peg 24 which is in a good area of the lake. Meanwhile, Mark drew peg 40 and his walk was literally 6 steps to his peg.